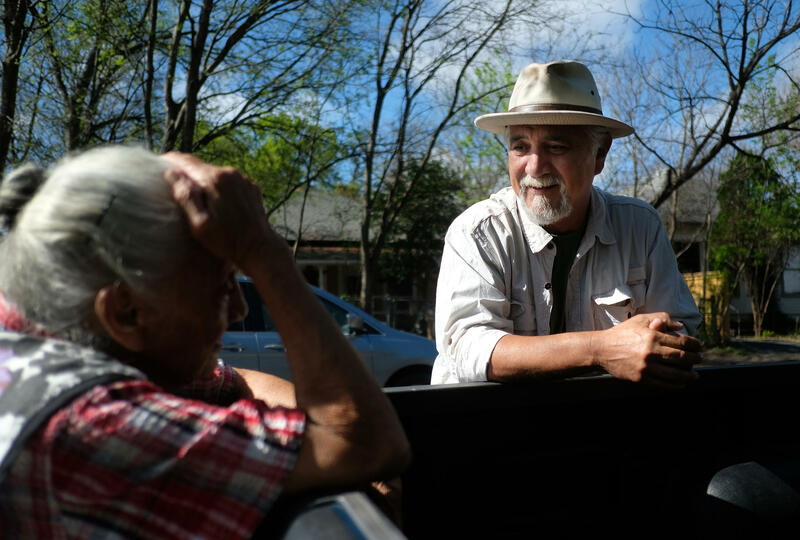 As East Austin Changes, What Power Do Neighbors Have to Stop It? Changes along East Sixth and Cesar Chavez streets have mobilized neighborhood planning groups, but some are still unable to shape the development in their neighborhoods. Recently, residents of the city’s East Cesar Chavez neighborhood asked a city of Austin committee to put in place interim controls potentially limiting the influx of new bars, restaurants and breweries. The decision was delayed – and then eventually denied. Had the action gone through, it would have been a rare decision. As things stand now, neighbors are at a loss for what power they have to temper the rapid development of East Austin. A few weeks ago, Bertha Delgado and other East Austin residents marched through the streets of their neighborhoods. Delgado recently scrolled through pictures on her phone, reading aloud the signs the neighbors held. Delgado sat on a small concrete wall that her grandfather built outside his home on Haskell Street in East Austin. He’s 90 years old, and he was sleeping in a chair on the porch. Delgado wondered what she could do to keep her neighborhood from changing so quickly. She organizes marches in protest of new restaurants and bars – places she describes as destination spots, and not establishments intended to serve neighbors. So, what at the city level can residents do to slow down what they say is a wave of development in Austin east of I-35? Ana DeFrates, Holly neighborhood resident and co-chair of the Holly Neighborhood Coalition, has a theory. “Our position is that the lack of a contact team is one of the reasons why you see changes occurring so quickly and so sporadically and seemingly unrelatedly in this neighborhood,” said DeFrates. DeFrates has lived in the neighborhood since 2003 and acknowledges that she is still a relatively new resident. But she believes that bringing a neighborhood plan contact team to the area is one answer to the question of how to stem the flow of development in East Austin. The city of Austin ratified neighborhood plans for most of East Austin in the late 1990s and early 2000s. The Holly Neighborhood plan was adopted in 2001; the East Cesar Chavez plan in 1999. These plans envision what the neighborhood should look like and, more specifically, how the land should be used. For example, should a given plot be commercial? Should it be residential? The city saw to it that each plan got a contact team – a group of locals deemed stewards of these plans. But as it turns out, DeFrates’ Holly neighborhood (bounded by Chicon Street, Seventh Street, Pleasant Valley Road and the Colorado River) does not have a plan contact team. According to city staffer Margaret Valenti, it’s one of only two parts of Austin that have a neighborhood plan (not all of the city does) but no contact team to defend it. In DeFrates’ mind, that is a significant loss. “What that means is that City Council, and primarily our district-elected City Council person Pio Renterio, is forced to make decisions on behalf of the neighborhood that don’t include the voice that is deemed a comprehensive voice of the neighborhood through the processes that are in place of a contact team,” she said. So what exactly is the potential power of these contact teams? In 2011, Brandon Testa went in front of the city’s Planning Commission looking for a permit to build a bar on East Sixth Street. At that time (and still to this day), the plot of land was a parking lot roughly a block east of I-35. “Our goal is to transform this land from an unproductive, run-down parking lot into a uniquely designed, well-lit, classy, clean and profitable service business,” Testa told commissioners in 2011. But when Testa presented his project to the East Cesar Chavez neighborhood planning team, they said no. “On March 16, 2011, the East Cesar Chavez planning team informed me that they would not support the project regardless of its merits and suggested I build a high-rise style development on the 6,400-square-foot site,” Testa told commissioners. Commissioners did not grant the permit. (Technically, they failed to either deny or approve it.) Several commissioners said they sympathized with the neighborhood’s wish to limit the number of bars on East Sixth Street. It was not a requirement of the planning process that Testa present to the local contact team. A formal presentation is required only if someone is seeking an amendment to the neighborhood plan – in other words, a land-use change. Testa was instead seeking a conditional-use permit, one that would allow him to put a cocktail lounge in place of a parking lot. But Donna Galati, who is with the city of Austin, worked on the case at the time and said she encourages developers to go to contact teams regardless, because commissioners will often ask what the neighborhood thinks of a project. Although Testa did not get his East Sixth Street bar, he did open one on East Cesar Chavez Street. Since it was a bar prior, it did not require going in front of the city for approval. Even if it had, that bar is in the Holly neighborhood – a part of the city without a contact team. Testa did not respond to a request for comment on this story. Alberto Martinez speaks with his neighbor Andrea Rodriguez. Alberto Martinez, a former chair of the East Cesar Chavez neighborhood planning team, said the power of a contact team can be great. But there are big limits: Volunteers man these teams, so the meetings they hold and the research they do is on unpaid time. Martinez said that when he looks around his neighborhood, he thinks of his 90-year-old neighbor. Castillo said she was too tired to talk with the Austin Monitor for this story. Residents cite lack of neighborhood consensus about the contact team – regarding whether there should be one and who would be on it, for instance – as a barrier to creating one. For her part, Delgado believes that development will keep coming, contact team or not. The current chair of the East Cesar Chavez team, José Valera, said his team could use some time to breathe – that development gets in front of the team so quickly it can feel insurmountable. The reason the city did not recognize the neighbors’ request for a quasi-moratorium on certain new developments is because a new draft of the city’s development code – the result of the ongoing CodeNEXT process – is so near. Through this process, the city will revise the code with the idea that neighbors will get another chance to say how they want the land in their communities to be used. A City Council committee is directing staff to look at adding requirements to the demolition permit system that would ensure tenants are notified of planned tear-downs. During a review of the city’s demolition permits, the Planning and Neighborhoods Committee heard from Sergio Lejarazu, the former owner of Jumpolin, the East Austin piñata store that was torn down in February with the merchandise still inside. A plan to turn 735 acres of East Austin parkland into a high-end golf course will get a public airing this evening. The City of Austin is hosting a meeting on the proposal for Walter E. Long park from 4:30 to 7:30 at the Morris Williams Golf Course at 3851 Manor Road. The city says the plan will bring jobs and tourist money to the east side. Under the proposal, developers would pay to build and maintain the course and give the city a cut of the revenue. That appeals to the Parks Department which doesn’t currently do upkeep on the land. But there’s opposition. Some residents don’t think Austin should give up so much space to a costly sport that a lot of people don’t play. The parkland is in Austin's City Council District 1. Ora Houston, the front-runner for the District 1 seat opposes the plan and has asked the City to postpone a vote until after the new council is seated.